Dubai, 05 January 2019: Dubai Investments PJSC has announced that work on the AED 460 million Fujairah Business Centre project, developed by its joint venture entity Al Taif Investment, is 20.5% complete and on track to finish in June 2020, well ahead of its scheduled completion date of Q4 2020. The joint venture between Al Taif Investment and Fujairah Investment Establishment will have a total built-up area of 96,400 square meters, offering a 19-level office tower and 19-level hotel and apartment tower as well as a shopping mall and retail area with parking for over 670 vehicles. 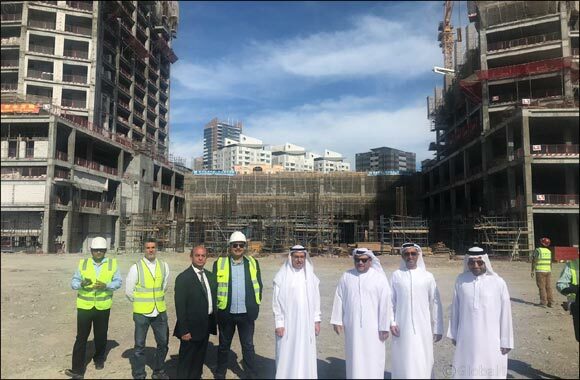 Dubai Investments MD and CEO Khalid Bin Kalban recently toured the site with the Board of Directors, and received a status update on the project. The hotel tower is now 18 floors high, with just two slabs left to cast and complete while the office tower has eight slabs still to complete. Mechanical, electrical and plumbing work on the project is ongoing, with the team close to finishing all block work. The team is carrying out procurement and the project is at a stage where interior d�cor, furniture and fitting project will be awarded. The Fujairah Business Centre is located in the Fujairah town centre, overlooking the Grand Mosque. China State Construction Engineering Corporation Middle East is project construction contractor with Dewan Architects and Engineers project consultant. Al Taif Investment is a collaborative effort between Dubai Investments PJSC and Fujairah Investment Establishment (FIE), the investment arm of the Fujairah Government.